A fascinating introduction to the human body that answers key biology questions such as ‘What is blood for?’, ‘What do muscles look like?’ and ‘How many bones does a body have?’. 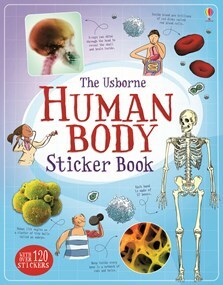 With over 130 stickers of organs, bones, x-rays, scans and cells to help children learn about the human body and how it works. A fascinating, fun and interactive science lesson.